Anne Boleyn in the Tower by Edouard Cibot | Wendy J. Dunn, Award-Winning Author. A picture paints a thousand words, the saying goes. For me, one picture has really painted thousands and thousands of words. Edouard Cibot’s Anne Boleyn in the Tower (painted in 1835), first captured my attention decades ago. Drawing me in by its powerful evocation of despair, sorrow and love, Anne Boleyn in the Tower became an important inspiration for my first novel, Dear Heart, How Like You This? and also birthed my play Before Dawn Breaks. My heart always knew that this painting was the only painting I wanted as the cover for my novel about Anne Boleyn. 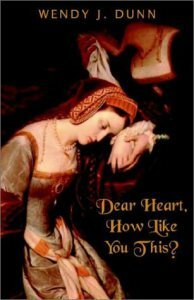 Published in 2002, Dear Heart, How Like You This?, I believe, was the first Anne Boleyn novel to carry this image, followed not long afterwards by A Lady Raised High and The Secret Diary of Anne Boleyn, originally published in 1998 with another cover. 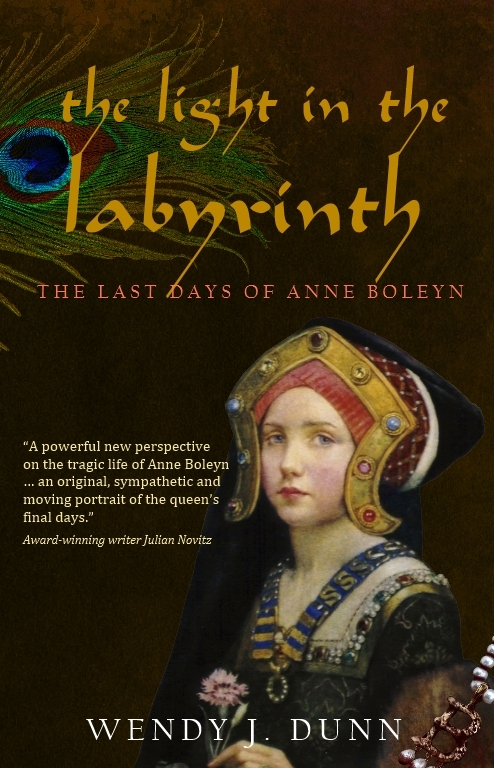 It is the placement of the painting on the cover of The Secret Diary of Anne Boleyn, and similar placements I have seen elsewhere (suggesting a belief that the foreground figure is Anne Boleyn) that has spurred me to write this piece about Cibot’s Anne Boleyn in the Tower. I want to tell you why, from the first moment I saw this painting, I recognised the figure receding into the darker background, the woman hiding her grief behind a handkerchief, to be the artist’s depiction of Anne Boleyn. Henry VIII turned his kingdom upside down to marry Anne Boleyn. Vibrant and intelligent and prepared to speak her mind, Anne proved her worth as queen and religious reformer. But she failed her main duty in the birthing chamber, giving Henry VIII only another daughter, Elizabeth. 1536, the year of her execution, saw Anne Boleyn miscarrying a son early in her pregnancy. This, her second, or perhaps third, miscarriage, gave Anne’s enemies, led by Thomas Cromwell, the clout they needed to work on Henry’s fears of dying without securing the Tudor succession, sparking a new civil war. My imagination colours Anne Boleyn in the Tower as the depiction of Anne on the eve of her execution. Less than three weeks before that night, Anne had been cast aside by Henry VIII and made his prisoner. Since then she had suffered through the executions of five men, one her brother, George, all accused of being her lovers. Sir Thomas Wyatt, a man who once said of Anne Boleyn he “could gladly yield to be tied forever with the knot of her love” and one of her lifelong friends, still languished in the Tower. Anne probably feared he would go to his death, too. Already tried and convicted of treason and adultery, she now waits for morning to face her own death. The next evening, Kate nestled against Aunt Nan’s knee. Flickering fire and candlelight netted them in amber glow. Shifting on her cushion in discomfort, Kate bent her head and lowered her gaze, trying not to think about the night and how it walled her in. How it gave her dreams that frightened her. The days were upsetting enough without fearing to sleep. She twisted towards her aunt. For a long time now—too long—Aunt Nan had sat on her stool without moving, without speaking. Since the great outpouring of grief when her brother went to the block, she had been like this. Even the news following shortly afterwards of the annulment of her marriage to the King had not stirred her. Aunt Nan jerked and then cried out in agony—a primeval cry that caused Kate’s heart to thump harder against her chest. Men forced to watch their entrails burnt before their eyes—did they cry out like her aunt? Cry out so the very stones would hear and remember forever? So, why do I identify the figure in the foreground as a girl? In the painting, this girl’s hair falls long and loose, with decorative plaits, from underneath her coif. Now study the woman behind her – her hair is hidden under a gable. It seems clear to me that the unbound hair of the figure in the foreground declares her maiden status, her virginity, while the figure in the background is the matron, the married woman – for only unmarried or ceremonial queens wore their hair loose at the court of Henry VIII. But this is not the only reason I believe Anne is the figure in the background. The painter obviously did his research about Anne Boleyn and the Tudor period because there are other features to help us identify this tragic queen. The black gown of the background figure for starters – black was known as one of Anne’s favourite colours. See the badge on the gown’s bodice – I believe it is meant to be the falcon badge of the Boleyns. Also, look how the painter has placed the two women. The girl in the foreground appears to kneeling on the floor, while the woman in the background is seated – suggesting the girl acknowledges the other woman’s higher rank by placing herself in a lower position. If that wasn’t enough – look at the older woman’s lovely neck, adorned by very Anne Boleyn type jewellery. Surely the artist is depicting here what we know of Anne from descriptions that have come down to us from history. Not only did a Venetian ambassador describe her as having “a long neck,” but Anne also said, steeling herself for her execution, “I heard say the executioner was very good, and I have a little neck,” both drawing in my mind a swanlike neck. I actually think the artist has made a powerful decision to depict Anne Boleyn in the background, with her face hidden. It not only suggests all the questions history leaves unanswered about Anne, but also acknowledges the unanswered question of what she really looked like. There appears to be no surviving portraits of Anne Boleyn from her lifetime, only tantalizing portraits copied from originals. The painting then leaves the viewer free to imagine what this woman would look like if she lifted her head to gaze at us. Ultimately, by placing Anne Boleyn in the background, the artist speaks to us of all the things about her we can only guess at. This painting has inspired my imagination again and again. Over two years ago, I starting wondering about the girl in the foreground – could she be, I wondered, Anne Boleyn’s teenage niece, Katherine Carey? Could the many suggestions from history books be true – that Katherine Carey witnessed her aunt’s execution? Answering those questions took me to the writing of my short play and a new novel, The Light in the Labyrinth. Please visit Book’d Out and Confessions from Romaholics to read what other writers have written for this Giveaway Hop.